On Monday, Dec. 3, more than 700 male and female amateur boxers converged on Salt Lake City, Utah, for three national tournaments, the USA Boxing Elite and Youth national tournaments and the Junior Open. The competition commenced today (Tuesday) and runs through the Elite Finals on Saturday. For boxers in the Elite bracket (age 19 and over), the Salt Lake tournament serves as the first qualifier for the 2020 Tokyo Summer Olympics. Winners in the junior (15-16) and youth (17-18) divisions will be invited to train at the U.S. Olympic Training Center in Colorado Springs, CO. The men’s team is led by 19-year-old super heavyweight Richard Torrez Jr., the defending USA national champion. Torrez hails from Tulare, California (pop. 60,000), a community in the Central Valley of the Golden State that is home to many dairy farms. 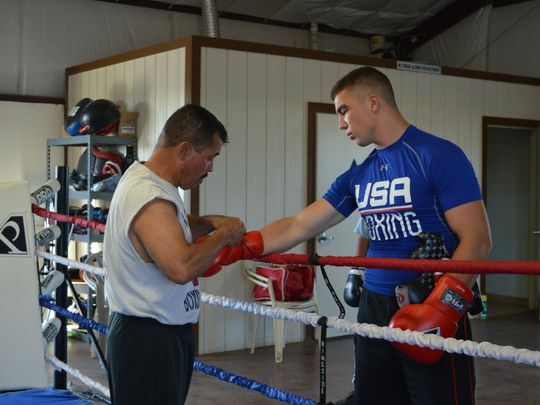 Torrez’s father, who was an outstanding amateur in his days, good enough to make the USA National Team, runs a boxing gym in Tulare. This will be a common thread in Salt Lake City this week, young boxers being coached by their fathers. But the younger Torrez, who customarily carries about 220 pounds on a six-foot-two frame, is a well-rounded young man who doesn’t want to be defined by his fists. At Tulare’s Mission Oaks High School, Torrez played football and basketball, was the president of the chess club, and was named valedictorian of his graduating class. He hopes to eventually attend college and study mechanical engineering. Cal Poly and the U.S. Air Force Academy currently top his list of potential schools. If Torrez can keep winning, if he fulfills his Olympic dreams and leaves Tokyo with a medal, suitors with suitcases of money will grovel at his feet. And if he does well in the pro ranks he may even become as revered as Tulare’s most famous native son, the late Bob Mathias, a gold medal winning decathlete at two Olympiads and purportedly the first person to appear on a box of Wheaties. Two other Elite boxers, both top seeds, warrant mention. Heavyweight Cam F. Awesome, now 30 years old, is likely America’s most experienced amateur boxer. Seemingly around forever, he was recently named to the Team U.S.A. Boxing Board of Directors, which we gather was something of a lifetime achievement award. An interesting character who once aspired to a career as a stand-up comic, Awesome, who legally changed his name from Lenroy Thompson, is of Trinidadian and English descent and grew up in Uniondale, Long Island. Awesome was upset in last year’s national championship, losing in the finals to Toledo’s then 18-year-old Jared Anderson. If form holds up, they will meet again on Saturday. Anderson is seeded #2. The top seeded light heavyweight, New Jersey’s 21-year-old Khalil Coe, forged the biggest upset of 2018 when he stopped Cuba’s Julio Cesar La Cruz in the opening round at a tournament in Halle, Germany in June. Coe had only 24 fights under his belt. La Cruz was a four-time world champion and 2016 Olympic gold medalist. Coe is still rough around the edges, but apparently has a murderous punch. (In his next fight in the Halle tournament, he scored another first-round stoppage, this over a Slovakian.) Coe looks forward to turning pro, his style appears better suited to the pro game, and Team USA may have trouble keeping him.